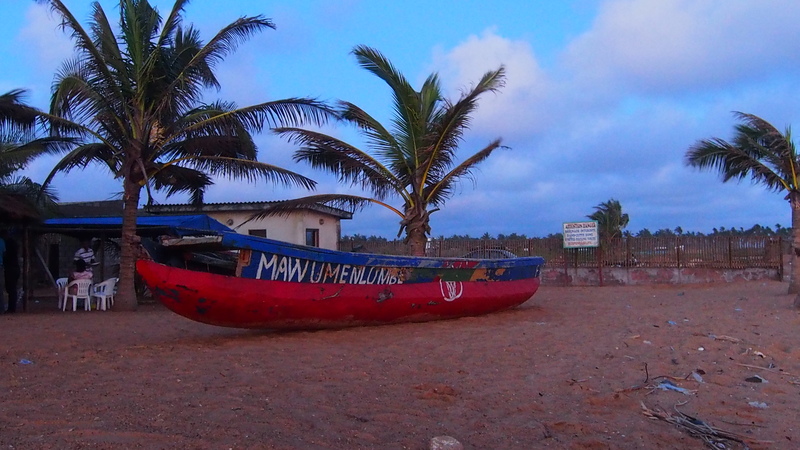 Crossing the border to Togo has become, somewhat surprisingly, a must-do on my bucket list. It’s funny how a move to a new country can change your travel desires. A few years ago it was camping in the Barrington Tops, now it’s Togo, a narrow slip of a country, wedged between Ghana and Benin. With a width (at the coast) of a mere 56 km, a length of 458 km, Togo is truly tiny. A Francophone country, like Benin further east, why Togo is not simply part of Benin (or vice versa) is a mystery to me, undoubtedly a relict of the colonial division of Africa. The differences to Ghana, not only in language, are immediately apparent, but I am getting ahead of myself in this story. Our girls had a swim meet in Lomé, the capital of Togo, and I thought tagging along would be an easy way to visit a new country. After all, it’s somewhat unlikely that we would visit Togo should we leave West Africa, and in the expat world of Accra fabled stories abound of French cheese and wine. Two very good reasons for me to visit. Of equal stature to these stories of French shopping, are those of border crossings. My optimistic nature made me believe it would not be as bad as clichéd images of any African border crossing. But like many, many aspects of life in Africa, it is unpredictable. The girls left with the school buses the day before us, and I followed their progress (on a very nifty app) on my phone. They seemed to be spending an inordinate amount of time at the border, and I thought perhaps once they crossed the border, their Ghanaian SIMs would drop out, leaving them virtually stranded at the border on my app. The SIMs did drop out not long after crossing the border, but the length of time at the border was real. But given there were literally dozens of students from a UN worthy list of passport countries, it is hardly surprising it took hours. Volta River flood plains: prime agricultural land in Ghana. 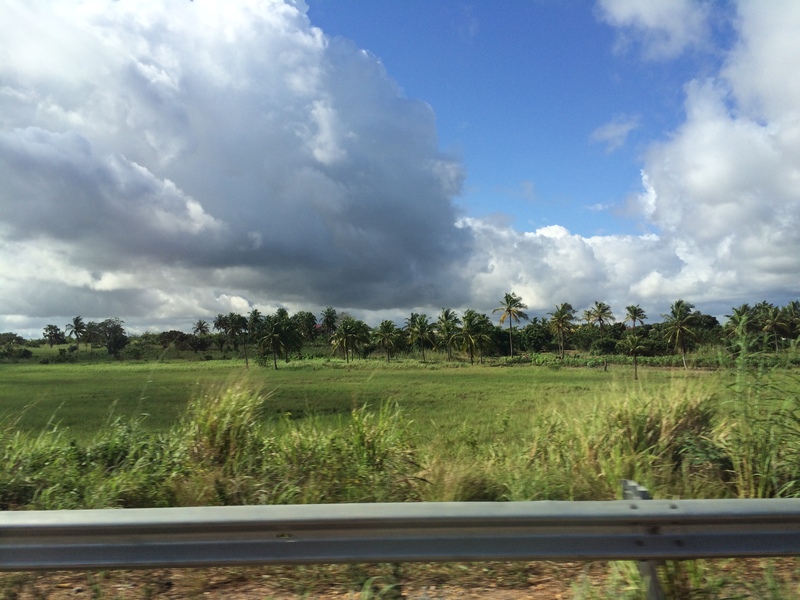 On Saturday morning we drove out of Accra. From the somewhat salubrious suburbs of Airport, we passed though the middle class neighbourhoods, and onto the dusty ugliness of the industrial Tema, Accra’s port city. Beyond Tema, the villages become smaller and the flat, agricultural land of the Volta river floodplains surrounded us. Like much of coastal Ghana, unless you can actually see the coast, it is not an obvious feature of the landscape. The misty salt air does not penetrate more than a few hundred metres from the shore, and it was only the slender coconut trees, clustered in small islands of the rice paddies which gave any indication that we were passing along the Gulf of Guinea. Towering mounds of bright red tomatoes heralded the harvest, with farmers and their children inviting us to purchase with the distinctive downward flick of their fingers as we passed by. The hours passed quickly for the road all the way to the border is good. I chatted with my travelling companion about the changing nature of aid, particularly to rural people. But that is a conversation for another time. Approaching the border, the road widens to 4 lanes, half of which are choked with tro-tros waiting to take those who have walked across the border to Accra. 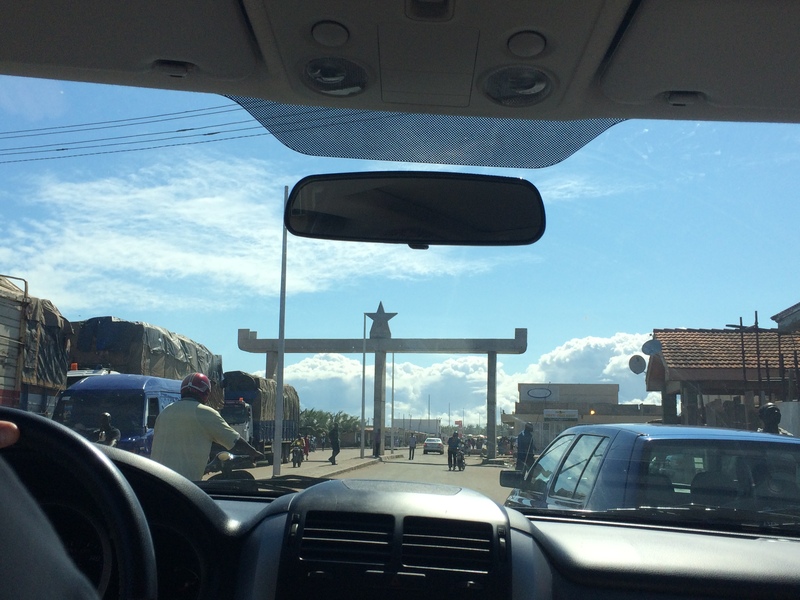 Ahead we could see a grand concrete arch, bearing the emblematic Black Star of Ghana. Grandiose, yet unpainted, it seemed a suitable gesture for an African border. Several large concrete buildings reeking of bureaucracy were scattered around both sides of the border and at the approach to these a man directed us to the customs building. These ‘fixers’ are a common sight at any point of bureaucracy in Ghana, and I presume Africa. For ‘something small’ they will assist you, generally whether you need the help or not. To cross the border in your own car, you need an ECOWAS Brown Card, which is an insurance certificate covering the ECOWAS states. I would advise purchasing it in advance from your car insurance company. If you have not purchased a brown card it may be possible to purchase one from the insurance agents at the border, or failing that, leave your car in Ghana, walk across the border, and take a taxi to Lome (which is right on the border). Customs cleared, we headed to Ghana Immigration, a cluster of small, dirty offices near the concrete arch. Ironically, as Ghana is a wealthier nation than Togo, the immigration procedure takes longer, as photographs must be taken and passports scanned. We entered the no-mans land between concrete arch and the real border, a rickety boom gate surrounded by haphazardly parked trucks and buses. Our man shepherded us to park in front of a small, open fronted office, which was manned by five Togolese Immigration officers. While my companion went to clear the car at Togo customs, Jock and I were free to watch the immigration process on the Togo side. The small office was full of young foreign volunteers, each filling out forms I presumed to be visa applications (we had our visas already in our passports). The immediate difference between the two countries was, of course, language. Five feet of road and we were listening to French with a smattering of English. I couldn’t tell which African language was being spoken, but I presumed it would be the same on both sides. This border and the languages that distinguish it reflect the recent past, the dividing up of Africa by the colonial powers, the African languages uniting the people for centuries before that. 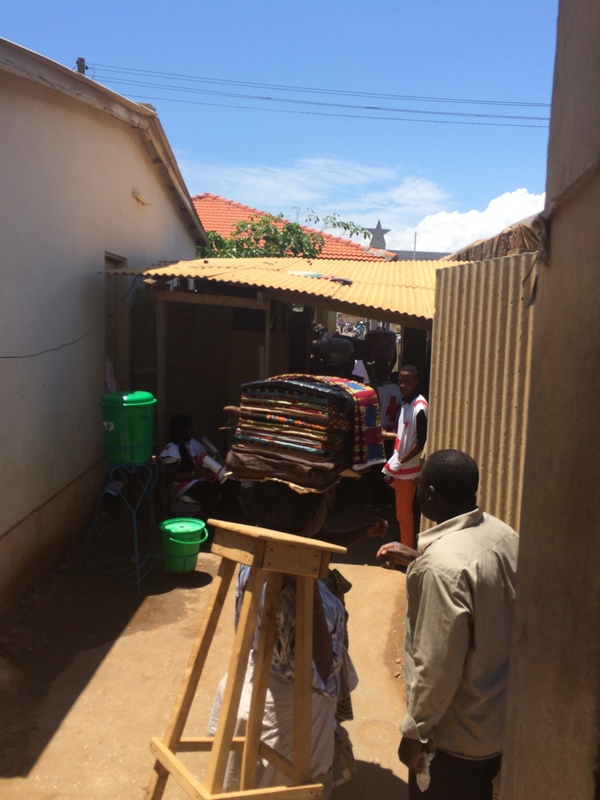 Adjacent to the passport control office, which was filled with foreign, passport bearing travelers, was a narrow gap in a row of small shanty houses. 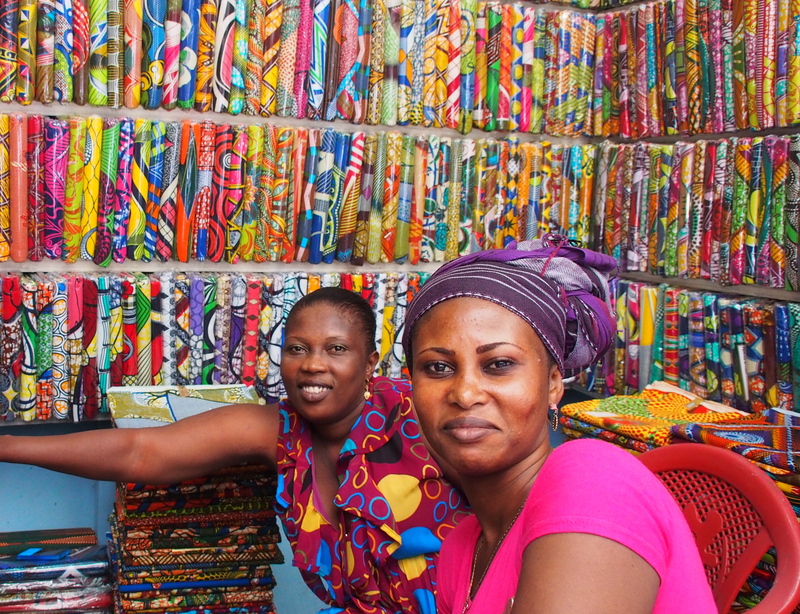 What caught my eye, more so than the stream of women traders all heavily laden with parcels atop their heads, was a distinctive white bib with the Rouge Croix du Togolaise printed on it. In this era of Ebola, all the traders crossing the border were being temperature checked. In a bizarre demonstration of the lingering effect of colonialism, none of the foreigners were checked. [Although on the way home, random temperature checks were done on some of the children in the school buses, although not all]. With no passport scanners or cameras on the Togolese side, once the queue had cleared, our passports were stamped and we were quickly on our way. It was a strong contrast from the villages on the Ghanaian side of the border, to the Togolese side, whose capital city, Lomé is right on the border. People inexplicably pushing motorbikes across the border, mounted them and raced off into the city. The coast was immediately apparent. 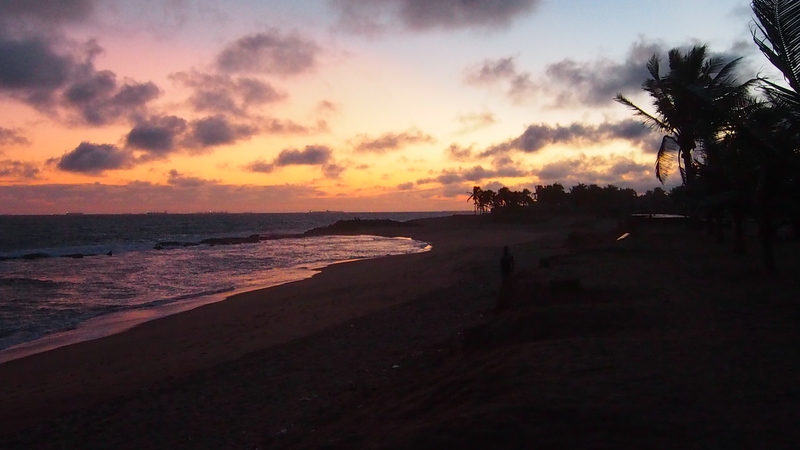 The coast in Accra is typically obscured by buildings, and never celebrated, but in Lomé the coast (at least from this ocean loving tourist’s perspective) was the focal point of the city. The wide clean roads ran parallel to the wide stretch of yellow sand bordering the blue of the ocean. So tiny is Togo that at the first roundabout the border with Benin to the east is signposted. We drove to the host school, along wide, uncluttered roads, surrounded by motorbikes bearing people of all description: grannies, families, couples, men with gas canisters and refrigerators and single women. While motorbikes are common enough in Accra, there is never the swell of motorbikes at a traffic light, and very rarely would you see a lone female motorcyclist. But here in Francophone Togo, the motorbikes swarmed around us and we jealously eyed the smooth flowing traffic. Was this lack of traffic, and the clean roads and beaches because in Togo there is simply not the population crush that there is in Ghana? (a crude comparison is a 6.817 million compared to 25.9 million people in Ghana) Was it something to do with cultural habits of cleanliness? Amazingly, I did not see one open drain over the weekend. The infrastructure seemed somehow better…better roads, better drainage, and hence less of the ubiquitous city stink. Perhaps this is in part to the attitude of former colonial powers to ‘look after their people’, as a French woman once described the situation in Francophone vs Anglophone West Africa. I’m not sure, perhaps a combination of them all. 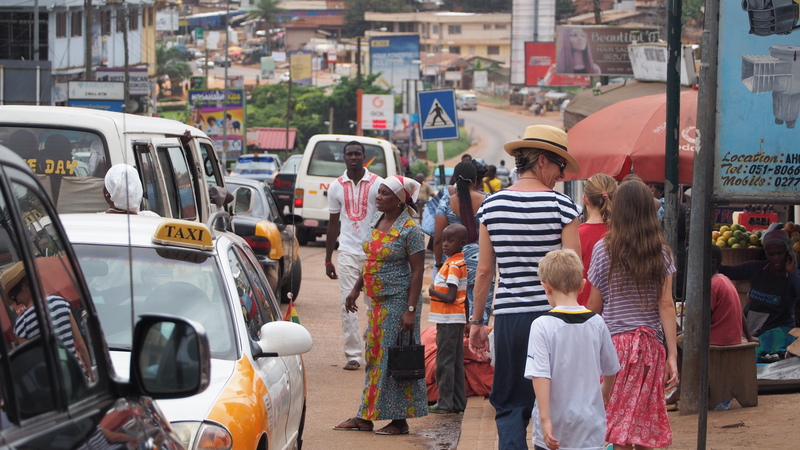 Certainly after the hustle of Accra, Lomé felt like a country town in comparison. I met a lovely Australian teacher at the school, thrilled to have met us, as we boosted the [known] Australian population of Togo from 6 to 10 for the weekend! Our hotel, modest by Western standards, somewhat salubrious by African standards, beyond the very large port/industrial area, was right on the beach. We walked over sand to our room. No sooner had we dumped our bags than we headed to the beach to catch the last of the days light. Compared to the beaches in Accra, the beaches here were very clean. Only the high tide line was marked by the predictable plastic bags and bottles, old toothpaste tubes and single, lonely shoes. Like much of this coastline, the waves were rough, but we ran through the foam, dodging the thousands of tiny white crabs out for their evening meal. The morning brought a delicious breakfast of croissants, coffee and juice. Another sign of the French. After a few hours of watching the swimming competition, a trip to a small supermarket rewarded us with stinky cheese and cheap French wine (“we look after our people’!! ), and while the extent of the shopping may have been overestimated, it was still very welcome. Four hours after leaving Lome, we were home. I was naively surprised at how different Togo felt from Ghana. The language of course is the most obvious difference, but the pace of life, the cleanliness of the city, and the ‘feel’ of Lome left me pleasantly surprised. I’m sure as an expat it is a very quiet place to live, but for a few days break from the traffic and stink of Accra, it was a very welcome break. 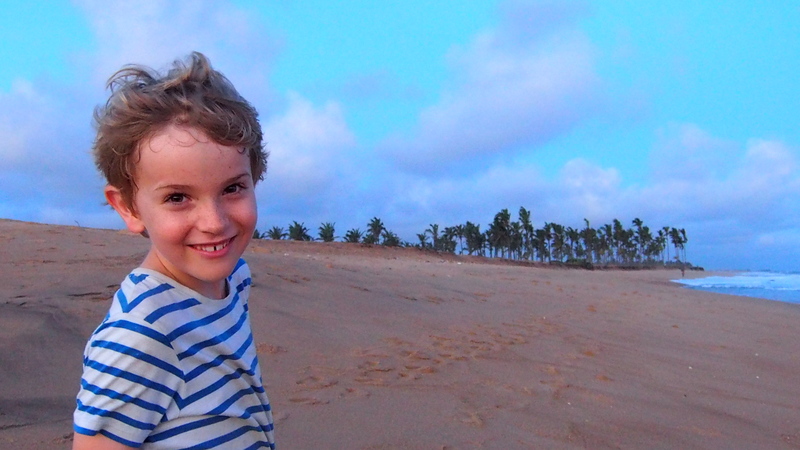 It’s got me thinking, apparently the beaches in Benin are pretty fabulous too…. 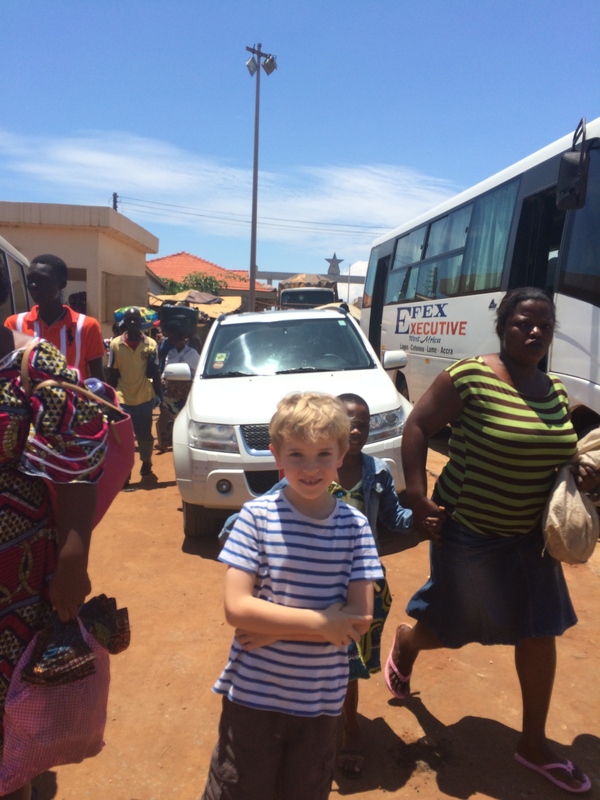 Thanks for sharing your trip to Togo. Never having been to Africa, I enjoyed the armchair travel. Our children enlarge our worlds in more ways than one, don’t they? I still tag along with my grown daughter occasionally when she goes to overnight work-related gatherings. Hi Jay. That is funny. I guess the grass is always greener on the other side of the border!! And you guys had croissants. That’s got to count for a lot!! Indeed! About the grass being greener, that is. After fuming about French colonialism during our 6-yr stay in Cameroon, we are constantly comparing (and missing Cameroon) so much, now that we are in Accra. Though that probably has more to do with the loss of all things familiar. Btw, the croissants are SO much better in Accra, as is all the bread I find here and the spectrum of wine & cheese 😉 Naah, I’m afraid we’ll have to hand this one to the English (not that I’m a fan of colonialism in ANY way at all! ), but they did leave the local civilizations slightly more intact in the wake of colonialism. I’m no fan of colonialism either, everywhere leaving disaster in it’s wake, and to be honest the French colonies overall seem to have suffered much more than the British in the wake of independence. But it did make me smile that we have to leave a gastronomic success to the British rather than the French! Yep, loved Togo when I was in Accra. So Chris, I’m assuming you’ll go again if a free weekend happens along? If so, make sure you get to the voodoo fetish market – wonderful mind boggling stuff. For a bonus adventure, hail a motorbike taxi to take you there. Safe, quick, easy fun. It’s getting out of Accra that makes Accra bearable. I loved reading your impressions and seeing photos of a part of Africa I haven’t visited before. My favorite post to date! Thanks! Thrilled that it is a favourite post, it was a fun one to write. Whereabouts have you been in Africa? We wish we could travel more on this giant continent. Hi there our amazing family. I so enjoy your blogs. Am a terrible correspondent – reasons you may guess. Have a wondeful silly season & stay well, happy & safe. Love Elaine & Peter, Auckland. I’ve been thinking about taking a little trip from Accra to Togo and this post has me convinced! Could you provide the name and ideally contact information for the hotel you stayed at on the beach? Hi Amanda, Sorry to say I can’t remember the hotels name…only that there was a dolphin motif! BUT, I can recommend staying at the beaches beyond the harbour/port (which is where we stayed), its a little out of town, but the beaches seem cleaner and less hectic. I’m sure a look on google maps would be a great help.